RJ45 ports and mini-GBIC (SFP) connector ports (total of 2 ports per box). Auto-selection between SFP and RJ-45 of Gigabit Ethernet interfaces with programmable priority. Supports IEEE 802.3 10/100/1000 Base-T auto-sensing GbE. And the selection of speed for each port is independent. 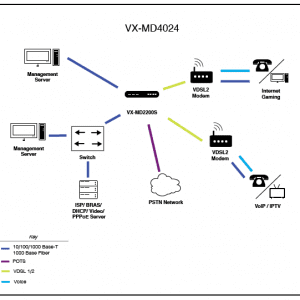 Auto-adaptive between full-duplex and half-duplex operation modes for 10 and 100 Mbps operation speed on a per trunk port basis. 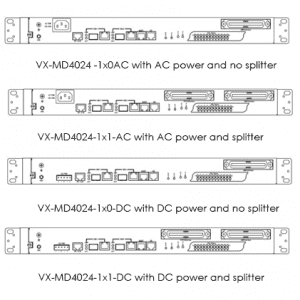 The system only supports full-duplex mode for 1000 Mbps. 24 xDSL subscribers lines and supports provisioning of the operation modes (VDSL2, ADSL/ ADSL2+) with a default of VDSL2 on a per port basis. Handshake procedure of each DMT xDSL circuit complies with ITU-T G.994.1. Physical layer management of each DMT xDSL circuit complies with ITU-T G.997.1. G.997.1 including Fixed (manually configured) and Adaptive At Init modes. 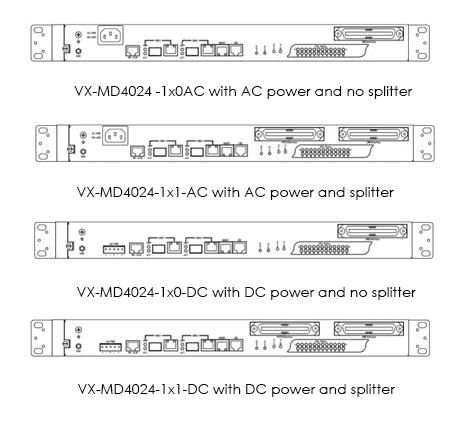 xDSL subscriber interface is able to support Fast Channel or Interleaved Channel independently for each xDSL port. Supports Upstream Power Back-off (UPBO) while received power exceeds configured max-aggregation-PSD in the upstream direction. Supports detection of Dying Gasp message from xDSL CPE and indicate a CPE power loss alarm in the management interface. This is cleared upon the commencement of a retrain operation (i.e. when the CPE becomes active once more). VDSL2 functions comply with ITU-T G.993.2. Supports selectable spectrum profile of 8a/b/c/d, 12a/b, 17a, and 30a for frequency bands (Annex A, B and C) defined in G.993.2 when operating in VDSL2 mode. 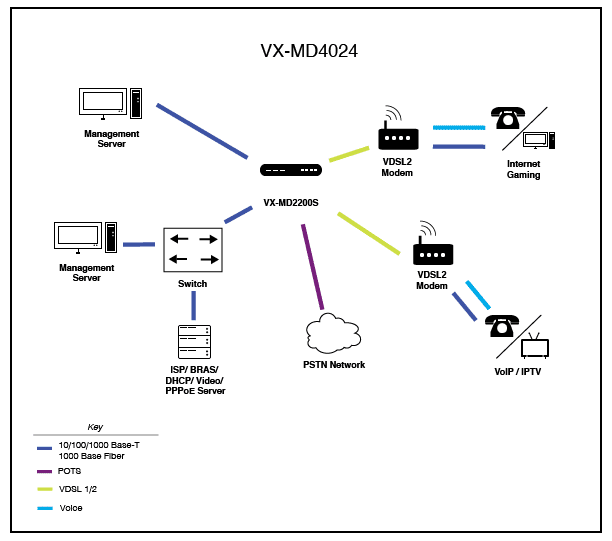 Support Packet Transport Mode (PTM) per G.993.2 when operating in VDSL mode. 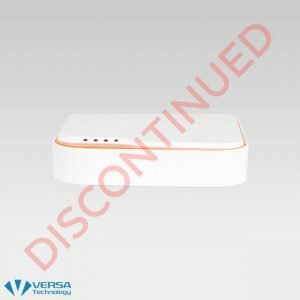 Supports VDSL OAM communication channels including IB (Indicator Bits) channel, EOC (Embedded Operations Channel), and VOC (VDSL Overhead control Channel). Supports selectable band plan A (profile 998, Annex A of G.993.2 and plan B (profile 997, Annex B of G.993.2) for each VDSL line on a per port basis. 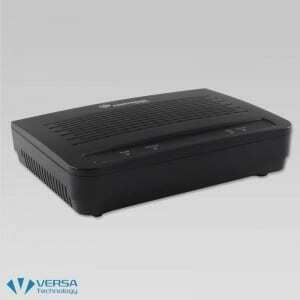 Line rate of a VDSL2 line port can reach symmetrical 100/100 Mbps or asymmetrical 100/50 Mbps at an ideal loop condition. Compliant with ETSI TS 101 952-1-1 option A for European, ETSI TS 101 952-1-3 for Annex B European ISDN, or ANSI 600. The splitter/low pass filter is passive element. Even if the system loses power (power supply fails), the POTS will still function. In-band management: provide all system OAM&P functions: software updates, configurations import/export, and management system interaction through trunk port. Out-band management: provide two kinds of management interfaces. One is the RS-232 local craft interface for basic provisioning. Interface default configuration: 9600 baud rate, 8-bit data, none parity, and 1 stop bit. 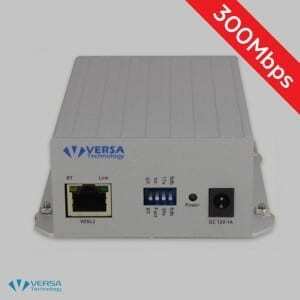 The other is a 10/100 Base-T auto-sensing Ethernet Interface. Provision-able aging time for MAC address table with a default of 300 seconds on a per bridge port basis. The uplink and line bridge interfaces support Spanning Tree Protocol (STP) per IEEE 802.1D and Rapid Spanning Tree Protocol (RSTP) per IEEE 802.1w. 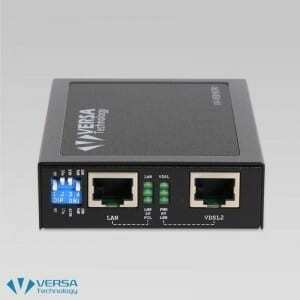 DHCP Server (IP allocation to DSL users), DHCP transparent forward, and DHCP relay agent option-82 functionality (the value within Agent Circuit ID and Agent Remote ID sub-options are configurable). Normal Forwarding Mode: the system follows general MAC bridging mechanism for DHCP frame forwarding. Secured Forwarding Mode: the system forwards DHCP frames according to attached Option-82 tags in downstream direction, rather than the destination MAC address of each DHCP frame. Link Layer Discovery Protocol (LLDP) defined in IEEE 802.1ab that allows network devices to advertise and also recognize identities and capabilities within devices which are directly connected. This feature can be configured on a per port basis. Supports filtering out broadcast frames (destination MAC Address 0xFFFFFFFFFFFF) in the downstream direction. When this option is activated, only protocol-specific broadcasts (DHCP, ARP) are allowed to be forwarded to downstream users. 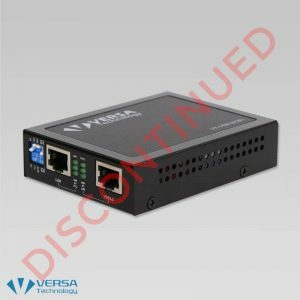 Supports Three Color Marking (TCM) rate limit policer in accordance with the Metro Ethernet Forum (MEF) Bandwidth Profile and RFCs 2697 & 2698. 8 PVCs per subscriber line; VPI range is from 0 to 255 and VCI range from 32 to 65535 conforming to ATM Forum UNI 3.1/4.0, PVCs only. Multi-protocol encapsulation over ATM per RFC 2684 / RFC 1483 for bridged mode, LLC encapsulation method only. Supports AAL5 per ITU-T I.363.5. Commits the supported ATM service categories in the increasing order of UBR, CBR on a per port basis. Provide sPCR (peak cell rate) configurable parameter for CBR service. Profile-based ATM traffic management (up to 16 traffic descriptors with one default and 15 user-configurable descriptors). PPPoE transparent forwarding and PPPoE intermediate agent. 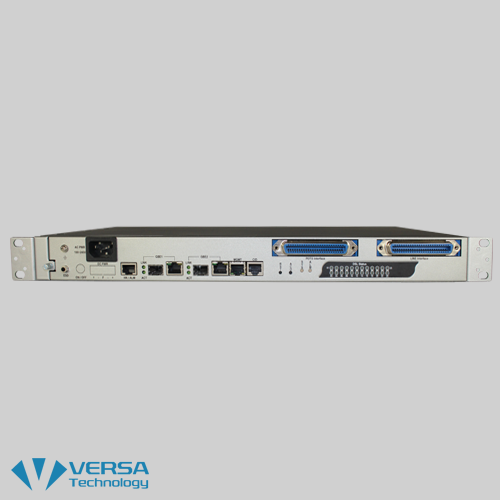 Performance Monitoring Monitors of line attenuation, noise margin, current rate, loss of signal, loss of framing loss of power and error second performance data of ADSL/VDSL statistics. 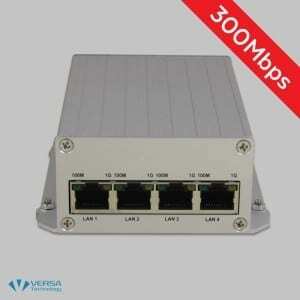 Ethernet RMON de­fined statistics are also provided. 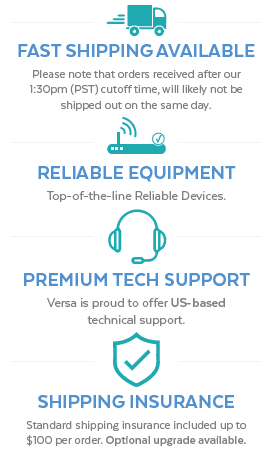 * Denotes features that will be supported via firmware upgrade.